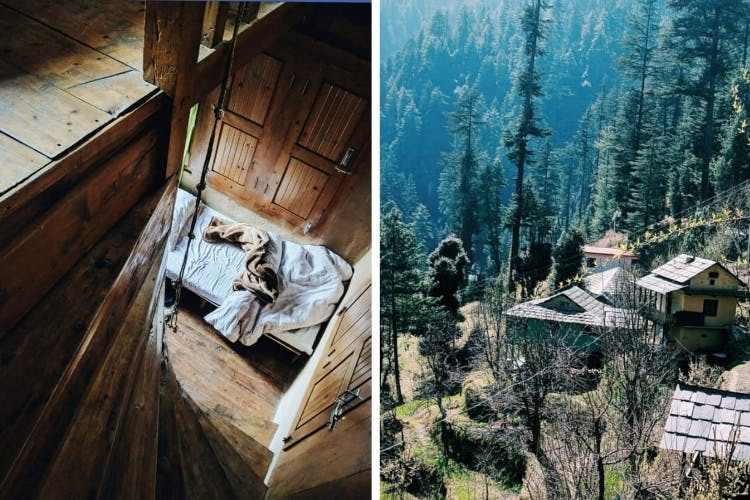 If Pahadi getaways are your thing, Rana Swiss Cottage in Jibhi, Tirthan Valley is your ultimate stay. Say hello to mountain dogs and watch the sun wash away the sky in the hues of orange and red. Spread towards the bottom of the hills, these wooden chalets are surrounded by simple Pahadi homes, a cafe, meditation area, and plenty of greenery. It doesn't shy away from the luxury, and they come furnished and offer epic views from the bedroom. The gushing Om River, a tributary of Tirthan Valley, will lull you to sleep with the sound of its ebbs and flows and from the cottages, you can explore your way down to the river. Plus, it's located close to Jibhi Waterfall! The stay comes with breakfast and dinner; they also arrange a guide for your treks, and since it's quite close to Jalori Pass, you can trek to Serolsar Lake and Raghupur Fort. The rooms come with heaters, hot water bags, and solid blankets to keep you warm. Solo traveler? Then check into their smaller rooms that cost you around INR 1,600 per night. Either way, this is a stay that will treat all your five senses. Honestly, we were quite let down by the food. We wanted to taste the authentic delicacies, but both authentic and regular food was meh!